"A new Syrian Constitution should be discussed and adopted by the Syrian National Council as soon as possible; certainly within the next two months. We should not wait for the fall of the Assad regime in the hope that a democratic constitution can be agreed in the extreme chaos that will inevitably follow. This mistake was made in Iraq as well as in Libya and Egypt where the West did not connect its support with a crystal-clear democratic constitution first and naively believed democrats would later win in the power struggle with radicals. All leaders of the different groups must personally sign and agree under oath to implement all the rules of this new fundamental law of the Syrian National Council. Any group which abstains must be excluded from any political, financial or military support by the West and the Arab States involved. We can only support rebels who fight for democracy and not a differently labeled dictatorship." “The continuation of the killing of more than 1000 civilians in Syria by dictator Bashar al-Assad must now be answered by innovative actions by the Arab states and the West. Words are not enough any more, he does not listen to them. Prosecutors can collect evidence of crimes and murder. Victims can report them to the staff. This has been done very successfully in Estonia where Tunne Kelam, Member of the International Advisory Board of WSN, and now a member of the EU Parliament, and the freedom hero of his small Baltic country - which was forced into the USSR in 1940 - established the Congress of Estonia in 1990 where 499 delegates from 31 political parties were represented, including the ruling communists . According to the UN and international law, universal human rights include freedom of speech, opinion, the press and religion. Societies like the dictatorship in Syria that disregard these universal human rights present a threat to their own people as well as other countries, as in Lebanon where the Syrian Secret Service was involved in the killing of President Hariri in 2005. “Since the beginning of the Syrian Revolution, the opposition has worked hard to unite its efforts in creating an all-inclusive representative body for the nation. The goal of this body is to support the Syrian people's Revolution and their struggle for freedom, dignity, and democracy. Over the course of eight months, the concept of a political umbrella organization that encompasses the youth of the Revolution, the nation's political forces, and national figures, emerged. This organization would deliver the message of the Syrian people in the field of international diplomacy, with the aim of overthrowing the regime, its figureheads, and the pillars upon which it stands to establish a democratic, multi-party, and civil state. The idea of the Syrian National Council (SNC) was inspired by previous initiatives and attempts at unifying opposition groups. It has become a pressing necessity to form a council that includes competent national figures to serve as a political umbrella for the Syrian Revolution in the international arena and support the just cause of the Syrian people, who yearn to be liberated from tyranny and create a civil democratic state. Mapping Syrian political groups that support the Revolution and preparing lists of national and effective figures for nomination. Determining the qualifications required for membership to the SNC depending on their duties. Establishing standards for representing the Syrian people on the Council in a manner that reflects the diverse nature of Syria socially, ideologically, and politically, with reasonable ratios. Working to overthrow the regime using all legal means. Affirming national unity among all components of Syrian society (e.g., Arabs and Kurds, as well as ethnic, religious, and sectarian groups) and rejecting all calls for ethnic strife. Safeguarding the non-violent character of the Syrian Revolution. The most important second WSN proposal was that “the Free Syrian Parliament as a first step should debate and agree on a modern constitution along the lines of the UN Charter protecting the freedoms of the people and promote religious and ethnic respect and tolerance”. 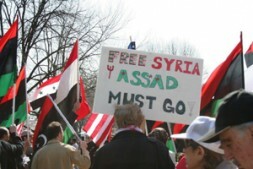 In Berlin on August 28, 2012 Syrian politicians proposed some first elements for such a new democratic constitution in a position paper labeled “The Day After Tomorrow. Supporting a democratic transition in Syria.” (Find the full text here – more in www.tda-sy.org and www.swp-berlin.org). Since January 2012 a group of 45 Syrian exiles have met at Ludwigkirchplatz in Berlin in the semi-official Deutsche Stiftung Wissenschaft und Politik (German Institute for International and Security Affairs) to discuss a modern constitution. These meetings were supported by the German Foreign Office, the Swiss Ministry of Foreign Affairs, the U.S. State Department and the U.S. Institute of Peace, and represent the first steps towards a new constitution. “Citizenship and equality of all citizens, rather than sectarian, ethnic, or gender considerations, should be decisive in relations between individuals and the state…The new political leadership and government should demonstrate a clear commitment to democratic principles and processes to break with authoritarian legacies”. The wording in the papers still sound a little like vague hopes without any obligations yet. It is a good step into the right direction, but after the bad experiences in Iraq, Libya, and Egypt, we should be aware that they are not yet smart enough to be successful. I prefer a different and necessary concrete time scale to promote the values of the UN Charter, which is missing in the paper, as well as other important elements and a global code of conduct..
1. The paper must lead now to a new Syrian Constitution which should be discussed and adopted by the SNC as soon as possible; and certainly within the next two months. We should not wait for the fall of the Assad regime in the hope that a democratic constitution can be agreed in the extreme chaos that will inevitably follow. This mistake was made in Iraq as well as in Libya and Egypt where the West did not connect its support with a crystal-clear democratic constitution first and naively believed democrats would later win in the power struggle with radicals. All leaders of the different groups must personally sign and agree under oath to implement all the rules of this new fundamental law of the SNC. Any group which abstains must be excluded from any political, financial or military support by the West and the Arab States involved. We can only support rebels who fight for democracy and not a differently labeled dictatorship. We can follow the good example of the Federal Republic of Germany where after the severe Nazi-dictatorship the Grundgesetz (basic law) was agreed in a constitutional assembly of 70 representatives from September 1948 to May 1949 before the federal state was established in 1949 with elections for the parliament in August 1949 and not the other way around. I strongly urge that a democratic constitution for Syria be established now with the SNC – it should be approved later in a referendum after the fall of Assad and the first free elections. Syria needs a solid foundation such as this upon which to build a modern state. It is naïve to think that out of chaos a stable democracy can be born – please look to the disaster in Iraq. The precondition for our support must be the announcement of a democratic constitution by the SNC integrating the UN Charter from 1945, protecting human rights, religious freedom, and minority protection. The Kurdish and Christian minorities must be integrated into the new state idea and their fundamental rights guaranteed – including local autonomy for the Kurds – with international assurance by the Western powers. On April 3, 2012 the SNC published an excellent paper named “National Charter: the Kurdish Issue in Syria” which describes its vision and commitments to resolve the Kurdish issue in Syria. Still too centralist a system is promoted which failed in Iraq. Syria must form a multi-ethnic federal state with an autonomous Kurdish region as has been done in Switzerland. 2. Only after this first step of a new constitution including rights for Kurds and Christians is agreed in the SNC and personally signed by all political leaders, a new Syrian government in exile should be constituted and recognized in November by Western and Arab countries and supported in step two. It can only include those forces who have signed under oath. Diplomatic relations with the Assad regime should then be cut. A pure focus on a military intervention by the UN or NATO as done in Libya is wrong as we need a credible and smart double-strategy of power and diplomacy first with the elements above. We need a political approach until the end of this year and can extend the military pressure after the U.S. elections in three months in a flexible response and action plan. By now a military build-up by NATO around Syria to prepare a military blockade or safe no-fly-zone or to pre-empt any use of chemical weapons is necessary. Diplomacy cannot work without the threat of power behind it (Fritz Kraemer). The military stick must be shown now and ready to use any time. In order to counter resistance from Russia and China, they must be shown that Assad can no longer survive in Syria, having long discredited himself by using the army to slaughter rather than protect Syrian civilians. Regime change is now inevitable – the only thing left to do is to facilitate a democratic transition and avoid yet more unnecessary bloodshed in the rush for power. Syria "breaking up before everyone's eyes"